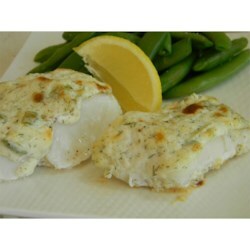 "Moist and delicious halibut is baked in a creamy topping with green onions and dill. This is the perfect recipe for dinner parties. Everybody loves this dish!" Preheat the oven to 475 degrees F (245 degrees C). Season halibut with salt and ground black pepper. Place halibut in the greased baking dish. Combine green onions, mayonnaise, sour cream, and dill in a bowl. Spread green onion mixture evenly over each halibut piece. Bake in the preheated oven until fish is opaque and flakes easily with a fork, about 20 minutes. Remove from the oven and let stand for 5 minutes before serving. The whole family will love this crispy baked fish. Garnish with fresh dill or a slice of lemon. My husband and I both thought this was too rich and heavy for an expensive fish like halibut. It covered up the taste of the fish. I won't be making it again. 1st time i made this, turned out awesome ! didn't have green onions so i substituted with chopped yellow onions - YUMMY DISH !! will definitely have it again and when i have guests !